Start Your Engines compiles works from Scott Robertson's, vast archives of ground vehicle drawings and renderings, and features the following chapters: Cars, Bicycles, Snowcraft Mechanimals and selected work from the conceptual design of vehicles for the video games Field Commander and Spy Hunter 2. 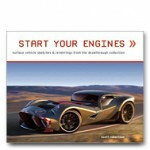 The Cars chapter comprises about half of thes book and features original designs both futuristic and retrospective. Categories: Books, we made too much on the reprint. Tag: scott robertson.